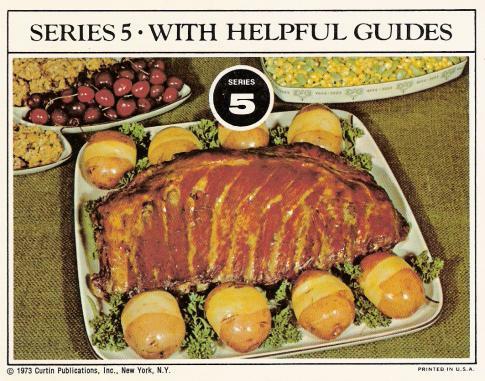 tags: bad food photography, vintage recipe cards, wtf did they do to those potatoes? Nutrition: To stay healthy, each member should have a minimum of 4 to 6 ounces of meat or meat alternate daily, which may be served at any meal. However, most people want more. Individual Appetite: Active men and teen-agers usually desire more meat than children under ten. Accompaniments: If the meal includes soup and several vegetables, less meat is necessary. Gravy of sauce extends meat flavor, too. A 6-lb bone-in roast will provide 2 1/2 to 3lbs. of cooked boneless meat, enough fo 5 to 8 servings. Time Available: Larger cuts take more cooking time, but leftovers may be used another day with little further cooking. Storage Facilities: If you have a freezer, stock up. Have meat cut in meal-size portions before freezing to hasten thawing time.